Jervaulx was originally founded in 1145 by Acarius Fitz Bardolph, lord of Ravensworth. 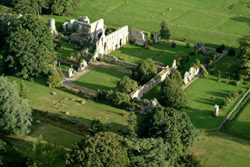 According to the foundation story, a group of monks from Savigny, Normandy, led by Peter de Quinciacus, wished to establish a house in Yorkshire along Cistercian lines. They sought land from the lord of Ravensworth, who gave them a site at Fos, by the River Ure, now known as Wensleydale. In 1146 the monks were refused membership of the Savigniac Order. The following year Roger of Byland petitioned on their behalf and was initially refused on the grounds that the community was too weak to survive independently, but Rogers persistence, perhaps coupled with the fact that the Savigniac Order was now absorbed into the Cistercian family, eventually secured their acceptance. (1) The monks of Jervaulx were formally acknowledged as part of the Cistercian Order in 1150, at the intervention of Bernard of Clairvaux. John of Kingston, a monk of Byland led a colony of nine monks from his house to instruct the new community in Cistercian customs; John presided as the first abbot. Jervaulx was especially renowned for its horse-breeding; at the time of the Dissoution a contemporary remarked that the Jervaulx horse was the tried breed in the north. (3) A rather unfortunate blot in the abbeys history occurred in 1279, when Abbot Philip of Jervaulx was murdered by one of his monks. Jervaulx was suppressed in 1537 and the buildings demolished early in 1539. The standing remains of the abbey include part of the church and claustral buildings, as well as a watermill; the pulpitum screen with part of the stalls can now be seen in Aysgarth Church. Another legacy of the community that is still enjoyed is Wensleydale cheese; the Jervaulx monks are acknowledged as the original producers of this cheese.